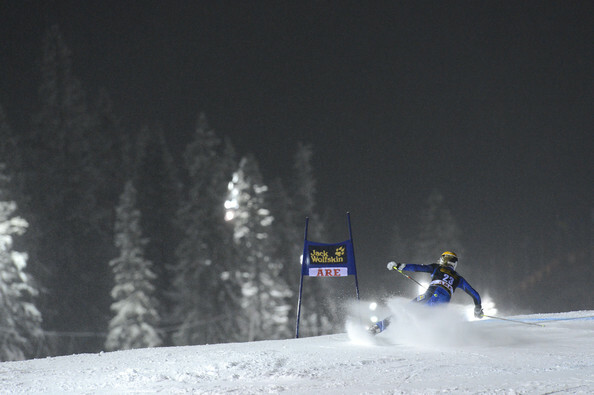 Ski&Tennis: Maze breaks podium record, Shiffrin amazing first time! Maze breaks podium record, Shiffrin amazing first time! Slovenian Tina Maze, after another amazing win last weekend in Courchevel, was called for another record to break. 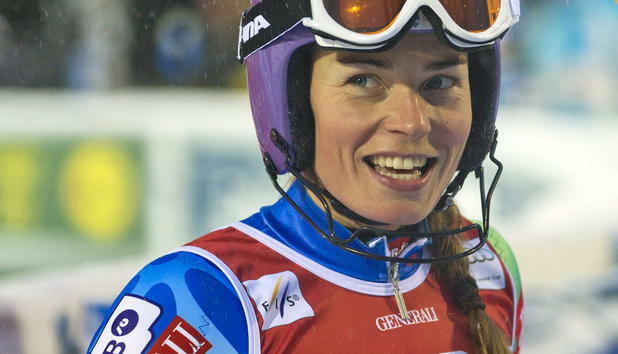 Her start of this season made the Slovene to win more races in the same season and we are not even halfway! But most of all, she was able to win all the first four Giant Slaloms, equalizing Karbon's record of few seasons ago. Had she made it to five, she would have done something extraordinary, but the quality of the field in the discipline is one of the highest this season and the rivals were angry for a victory: one out of them was the most motivated, Viktoria Rebensburg, the GS Cup winner of the last seasons had finished second behind Maze in Saint Moritz for a bunch of hundreds and after the debacle in the French race wanted to prove herself back. In last night's race the German already did something uncommon for the season, because she was the first one to finish ahead of the Slovene after the first run, but most of all she had done that in style, by setting a great advantage over her. Right after Tina, placed herself Austrian Anna Fenninger; the two had a good advantage over all the others, so that it seemed unlike to have big surprises regarding the final podium and so it was indeed as those 3 placed themself on top at the end of the race too. The rather easy hill of Aare and the even easier course set for the 2nd run didn't let much space open for making the difference and so not many come-backs took place. When the top 10 was to run down, French specialist Tessa Worley surely wanted to forget her rather pale first run and attacked the course with a better attitude and menaged to be fluid in the gliding parts around the middle. Tessa hit what was and eventually would be the best time for the run and that was worth a great jump up from her 8th place, but it was enough to make it to the podium as she finished 4th. Austrian Kathrin Zettel, for the first time in the season looked rather fatigued and menaged to stay in the top 10 just for a bunch of hundreds finishing 10th indeed. Anemone Marmottan came to Aare with a poor row of falls in the latest races, but a great first run had placed her as high as 6th, but sadly her streak was to continue as she fell in the early gates of the second run. Swedish slalom specialist Frida Hansdotter came to her home races strong of her best result ever in GS just scored in Courchevel and she wanted to improve it on home soil. 5th after the first run, the Swede -who was 5th in the French race- didn't menage to better Worley's time, but finishing right after her secured herself another 5th place, when immediatly later Maria Riesch failed to stay in front of Tessa and Frida too. Anna Fenninger knew she had some margin over the French leader, but she didn't want just to finish her run still on the lead, she wanted to provide an assault to the first place and so she had to invent a great run, even better than her first one. Her run was very impressive indeed, but didn't better Worley's partial time, so despite her big lead over her by the finish it was hard to believe she could make up all the gap with Rebensburg. But before that it was Tina Maze's turn, the queen of this year's GS, the Slovene looked a little tired though and seemed to have a not so great feeling with the Swedish snow, so despite a great show of technique and lines, she wasn't as fast as usual and in the end, she couldn't stay ahead of the Austrian breaking her hopes for keeping the winning streak alive even before the last skier had run down. It was all on Viktoria's hands or better on her skis as she had a huge advantage to administrate, but she seemed not to be content with winning only, she wanted to give a sign that she is still the best one and so she attacked as if she had to make up a gap. She looked unstoppable and even gained a bigger advantage after the first part, then suddenly a huge mistake slowed her down and her gap drastically reduced. Suddenly a safe victory seemed to be under question, even more when few gates from the end another big mistake happened to Rebensburg, but she reacted as the champion she is and despite it all she still finished with a big gap of 60 hundreds ahead of everybody else. If the GS didn't give many emotions the slalom that followed the day after surely didn't lack of them. Even before its start a news shocked the whole world of skiing as Marlies Schild injured herself during a training in the morning and vague news give her out possibly for the whole season. The race started with an unexpected fall from one of the favourites as Kathrin Zettel went out, then it was Maria Riesch's turn, but the German didn't shine in the Swedish night and in the end was just 7th at the end of the first run. Tina Maze then took the lead, with a very solid run and she kept for the whole time the first group was featured, but today it was the day of youngsters as many of them found their best results in the first run and eventually by the end. First Mikaela Shiffrin started with a very aggressive attitude and by exploiting the lightheartedness of her 17 years, she skied as if it was effortless and in this way she could better Maze's time and jump on the leadership. Her status didn't last much as hot-form Frida Hansdotter, after a terrific run, overtook the American in the leadership. Another Swede soon made her name big as Maria Pietilae-Holmner fought very hard and in the first intermediates stayed close to her team-mate, so much that she finished 3rd by the end of the run. Another good news came, this time to the Canadian team, as last year's first time winner Erin Mielzynski, after many disappointing falls scored a very good run, placing herself on the 5th place, just behind Maze. The great day of the Swedish team didn't end with the top names, and not even the fall of Wikstroem - who was on the way for a great time too- could make it go bad, as Nathalie Eklund was 9th. In the second run Swiss Wendy Holdener scored the best run time, but it didn't give her much of a raise in the ranking since from 14th she finished 10th. The young Swede Eklund didn't let the placement of the first run scare her and by showing another great display of technique she took the lead and climbed the ranking finishing as high as 6th, her best result so far in WC. Erin Mielzynski had a lot of pressure on her shoulder because of the many falls, but this time she could stay strong and despite looking a little cautious at times she menaged to keep her position, 5th at the end and her second best result in world cup. Tina Maze, only 4th in the first run knew she was just one podium away from the record of number of them before the new year, but most of all, she knew Maria Riesch had a pretty bad day and was almost sure to finish out of the top 10, so when she started she found back the fire she had in all the races she ruled so far and made a terrific display of her great weapons such as strneght and technic. An outstanding bottom part made her cross the finish line with a very big lead and in the mind of everyone the image of her first win in slalom for the year was already there. If Maria Pietilae couldn't do much to stop the Slovene, Mikaela Shiffrin surely had something else on her mind, as when she started, she started to win. The American looked incredibly solid and despite the fighting attitude she barely ever fell backwards with a complete control of her skis. Before the last section she was very tight with Tina, who had the best bottom part up to that moment, but Mikaela topped that one too and finished with the best time in front of the world cup leader. First run leader Frida Hansdotter then knew that if she wanted to achieve her first victory in world cup she had to outdo herself and she tried, she gave everything to stay in front of the young American, but a little too wary bottom part took that chance away, but as the big celebration while crossing the finish showed, she was very happy to be back on podium, even if again of the second place. To double the joy of the moment, with this very first victory Mikaela jumps in front of Tina Maze in the slalom cup and snatched the leader bib from Maria Riesch.